A few months ago, I came across a dutch pancake recipe on orangette’s food blog (via not martha) and I was eager to try making myself. The only thing holding me back was the fact that the only cast iron pans I owned was a teeny-tiny 3 inch pan that I used to toast nuts with and my La Cruset grill pan. Neither would work for this recipe. Fast forward to post-wedding gift bounty and our lovely new 8″ La Cruset cast iron beauty. Preheat the oven to 425 F. Melt 1 T butter in your 8″ skillet over low heat. If you’ve got a 2nd skillet, melt remaining butter. Otherwise, you’ll have to make one pancake at a time. Add your eggs, flour and milk and give it a go in your blender until frothy. Pour batter into your hot skillet and place into the oven. Bake for 25 minutes. When puffed, remove from oven and drizzle on the lemon juice and sprinkle with powdered sugar. Repeat with the other skillet if you don’t have two (who has two?). Pause only to inhale. Dig in immediately! Kickpleat, that is one beautiful baby! I’m so glad to hear that it was a hit. And as for Cornelius’ comment–now that’s a good man. Thanks Molly for the recipe! It turned out lovely and I can’t wait to make more. mmmmmm!! Hello kickpleat! I was another introduced to Jimmy’s Dutch Babies by Molly, and they have now become a staple in my house. My fiance also enjoys them with sautéed apples (brightened with a bit of lemon juice). Now you’ve got me craving them for this weekend. Cheers! ooh, with apples this recipe would be divine! and it looks like you’ve got some great apples on the go! lucky! We call this “Egg Baby” in my husband’s family – of Swedish ancestry, not Dutch! Hee hee! If you want sweet instead of savory, we leave off the topping and top with mustard instead! Sounds strange, but delish! 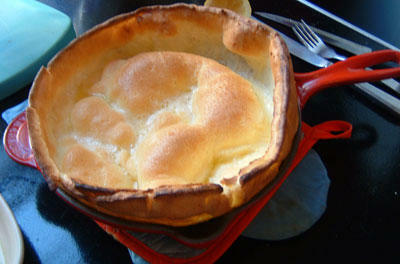 Yorkshire pudding… That’s what it reminded me of.